Retaining walls often are the structures of choice for many types of land and water control and manipulation, as they are a means to obtain or maintain dominance over the natural environment. Retaining walls using mechanically stabilized (MSE) backfill are one type that may be employed to address soil erosion of river and stream banks, as well as flood mitigation. MSE wall advantages include lower construction costs than conventional walls, and a broad range of aesthetic and design options. Downtown Johnson City, Tenn., implemented these walls. The design allowed for stream access, as well as stability. LDA Eng., a Tennessee firm specializing in public infrastructure, was hired to address severe flooding in Johnson City. For decades, the historic downtown district had suffered near-constant flooding at the intersection of two large streams. The flooding was a plague to area property owners and thwarted new business ventures. A 16-sq-mile watershed was draining into the creeks. In decades past, flooding was addressed with culverts built to transfer the creeks underground. Soon larger culverts were needed, until these did not have enough capacity to convey the water from heavy storm events. Andy Best, storm water manager for Johnson City, said that the old system could not handle a five-year storm; Johnson City was prone to flooding even without severe weather. A downtown task force was formed, which ultimately chose LDA to serve as its technical staff to help with meetings and provide engineering consulting, analysis and design. Certain measures were approved and incorporated into a multi-phase master development plan for the city. The retaining walls extend the entire length of the project. 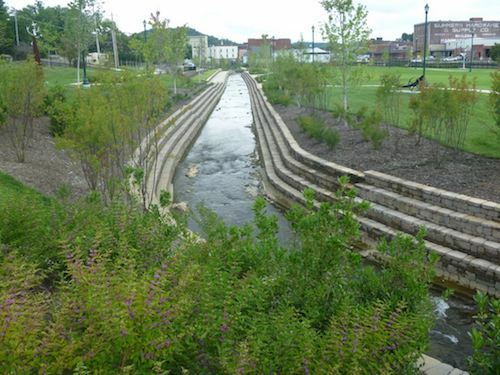 The plan’s priority projects were to create Founders Park, which would be a beautiful, city-owned park, and reconstruct, stabilize and make sustainable the problematic stream system. This was the initial step in addressing the flooding, incorporating flood control measures and upgrading this stretch of the stream. Its long-term goal was to allow the downtown to realize its full economic and cultural development potential. The park project removed 700 ft of the underground Brush Creek triple barrel box culvert running beneath an old warehouse. 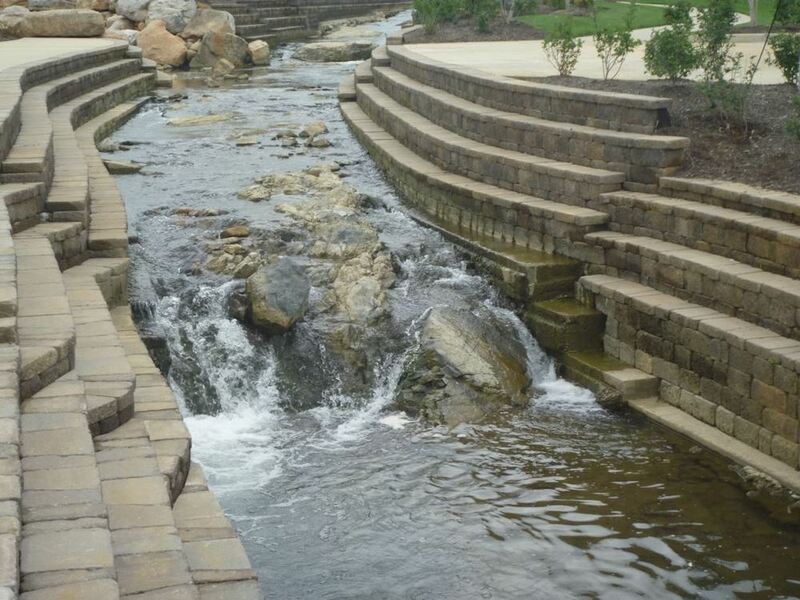 It built an environmentally enhanced channel and constructed a 5-acre greenway park along the creek banks, which features a 200-seat amphitheater. Keystone’s Country Manor wall system was specified by the engineering firm Lamar Dunn & Associates for the tiered channel walls. 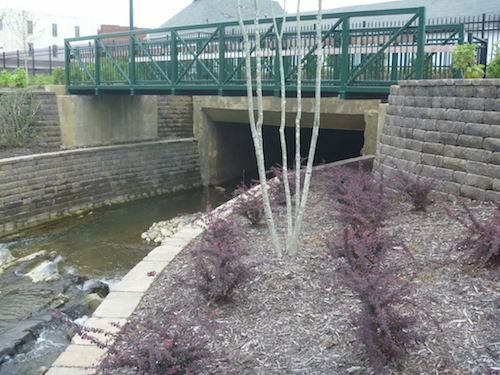 Because the creek walls would be completely submerged during major rain events, one of the most important considerations in selecting the wall system was that it had to withstand significant water flows and rapid drawdown of water from urban streams by stabilizing the sides of the streams. In addition, the wall system’s aesthetics and design versatility made it capable of handling all the requirements of the project. The channel wall design was for a stepped wall configuration that allowed for stream access during low-flow times and stability during high-flow events. The maximum height is 10 ft, with the longest wall at 933 ft and a total wall length for the project of 2,278 ln ft. The total wall area on the project is 12,415 sq ft. The retaining walls extend the entire length of the project. The original bedrock was good, so the concrete leveling pad was installed on it. The wall system also was used to construct seat walls for the amphitheater. Two prefabricated Contech Connector-style, Continental pedestrian truss bridges, one a 25-ft span by 8 ft wide and the other a 35-ft span by 8 ft wide, were installed at the site. The painted steel structures were selected for their durability and aesthetic quality. Trex, a composite material made from recycled wood and plastic, was selected for the decking for its longevity and durability. 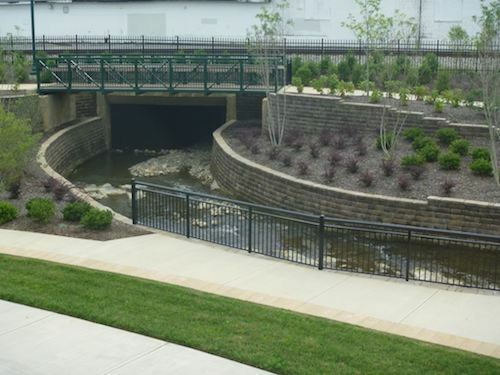 “Since its completion … Founders Park provides an outstanding downtown gathering area, improved local drainage, an environmentally sound stream and a major step in the implementation of the master plan,” said Don Mauldin, P.E., of LDA Eng. He added that the park has been successful in sparking redevelopment in the form of historic building renovation by a café, construction of a nearby multi-story residential building, small businesses locating in the downtown area, and many groups working with the city to stage events in the park. A second phase of the master plan included an enhancement of another upstream section of the channel. The completed plan was a $30 million investment in flood mitigation measures and development of two parks that largely has alleviated flooding in the downtown area. Because of its location, aesthetics were an important factor in the project. The downtown district was built on a floodplain, and when it rains hard during a short period of time, like it did late summer 2018, the two creeks again overflowed their banks. “Obviously we can’t protect [downtown] from large storms, but we did improve [the situation],” Mauldin said. Both Founders Park and the second new park, King Commons, were designed to provide a place for water to go, directing it back into the city’s storm water system. At times even that can be overwhelmed, particularly when drainage pipes become clogged. Best said the rainfall they received in an August 2018 storm greatly varied around the town. His department recorded 1 in. of rainfall in 20 minutes, but at a housing development on Washington Ave., he said a contractor recorded 2.1 in. of rain in 15 minutes. “I think it was anywhere from a 10- to 50-year storm,” Best said. His department will continue to look at ways to improve its flood mitigation, including improving the slope on one of the streets to ensure water flows into the basin area more easily. “We’re going to try to add some additional inlet capacity, just to get it into that catch basin area,” Best said. The battle will go on, and climate change will not make life easier for this Tennessee town. 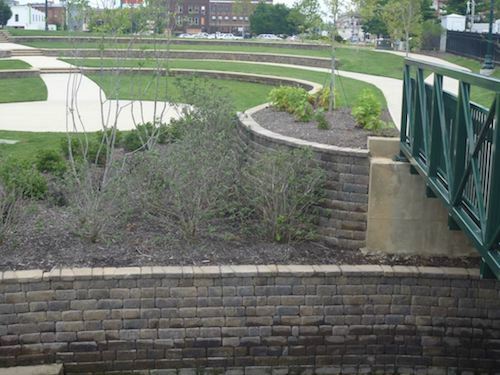 Founders Park provides a community gathering space and offers environmental benefits.